We enjoyed lunch with Christopher at Jimmy Changas on Saturday. We all ate the Vera Cruz. Kathi and I shared one and Christopher ate the other. The conversation was a little about his work and a lot about politics. He is often more aware of what is going on than I am. I spent the afternoon writing, while Kathi watched TV. I printed the first few chapter of my book, “Memories of Larry” for Kathi to edit. She makes all my writing better. I hope to have the book finished by mid-year, so I can start the formatting for publishing process. I think friends and family will like the book because it is personal. I think other people that have had a serious illness or been around someone with a serious illness will like the book, also. We had lunch with our sister-in-law, Andrea Clark at the Pipeline Grill on Sunday, after she went to church. Andrea ate the breakfast buffet, Kathi had a Greek salad and I had pizza. She told us her daughter Amy would be in town sometime this week. We will make time to go visit when Amy is here. We stopped at Walmart for shopping on the way home. Traffic on Highway 146 was bad through the Seabrook-Kemah area. I heard that part of I-45 South was shut down for the week end. I suspect that forced more traffic onto Highways 3 and 146. We stayed home in the afternoon I finished reading “Invisible” by James Patterson and David Ellis. It is interesting that Patterson is putting out books recently with co-authors. I do not recall him doing that in the past. I do not recall reading other James Patterson books, but “Invisible” was a good story. It was a mystery with a female lead character. I enjoyed the book. The rest of the afternoon, I was writing. We talked to AJ by phone, Monday morning. He had a lot of things going on and enjoys talking about them. Kathi made a stop by the post office to mail a package, then went to Kroger for grocery shopping and exercise. Her back and legs give her problems in the evening and walking during the daytime helps. It gives her an opportunity to go up and down every aisle at Kroger. She likes to check out the meat department to see what they have on sale. She finds some good bargains at Kroger. 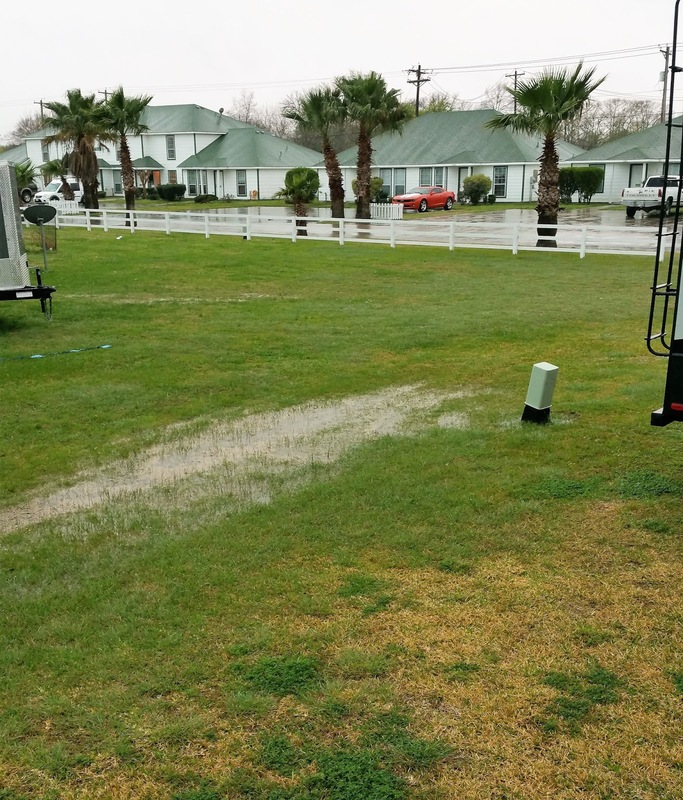 Standing water behind our motorhome. Kathi and I were both awake before the alarm went off this morning. It was overcast and humid Monday and Monday night. We ran our dehumidifier much of the day and into the evening. Humidity got real high this morning as rain started leaking from the clouds. It brought some thunder and lightning with the rain. We had planned on laundry today, but changed our minds. We will put that off one more day. Writing and staying dry seems to be my best option. Kathi is reading. 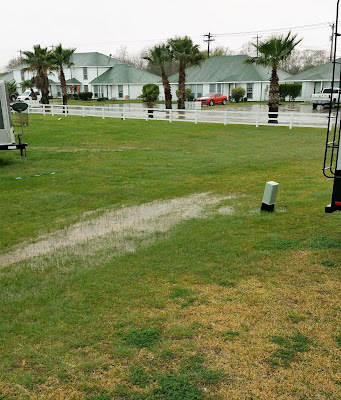 We enjoy hearing the rain on the top of our motorhome. It is relaxing. I hope it washing the dirt off our Jeep. Good times.